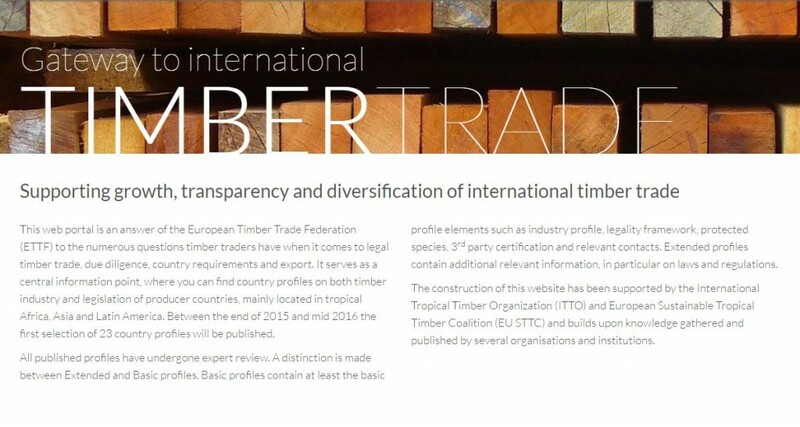 “Supporting growth, transparency and diversification of international timber trade.” That’s the welcome line of the new Gateway to International Timber Trade, the European Timber Trade Federation’s new online timber sector legislation and industry information website. Launched on January 7, www.timbertradeportal.com is a ‘one-stop information point’ for timber industry regulation and broad trade and business data in selected countries. Its aim is simultaneously to help international traders do business with tropical and other suppliers worldwide and ensure the trade is legal. The industry worldwide faces increasingly strict rules to curb illegal timber trade, with the EU Timber Regulation, US Lacey Act, Australian Illegal Logging Prohibition and Japan’s Goho system most prominent. Against this background, ETTF members decided they needed a current, easy-reference tool on legislation, primarily in tropical supplier countries where legality questions are most in focus. Hence the new Gateway site. The goal is to support importing companies in their illegality risk assessment, due diligence and due care procedures under these stringent new legality rules. Its aim is also to create a level playing field in satisfying these requirements between small and large companies. At the same time, it was decided to make the new site a versatile business tool, so users can source a range of useful data in one location. It includes up to date industry figures, business, industry organisation and government contacts, and links to further information. The Gateway is supported by the International Tropical Timber Organisation (ITTO) and Sustainable Tropical Timber Coalition (STTC) and the site was developed by Dutch forestry, plantation and certification consultancy Form international. It draws on ITTO, FAO, ITC/Tradecom and other databases and has an ‘extensive contact network of experts providing input and helping keep it up to date’.